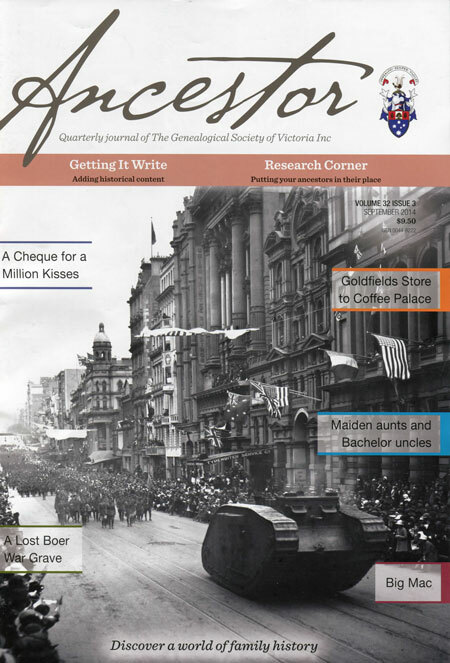 The Society's award winning journal, Ancestor, is published quarterly and is mailed to all members of the Society. Ancestor subscriptions and individual copies may be purchased . Details of GSV Talks, Classes, Courses and Seminars held in the Society Meeting Room. Includes a calendar of events. A topic of interest to assist you with your research at the GSV, by our Research Manager. A list of material added to the Library since the last Ancestor. Articles and information from various Societies' publications that may be of interest to members, by our Research Manager. News and information about our Discussion circles, Service groups and Member Societies associated with the GSV. An update on the Society from our President. Information and help from the GSV Writers Circle. Reviews & notes about various blog articles or interest. Update of happenings at PROV. GSV Members can now search online all articles that have appeared in Ancestor in the GSV catalogue. Search by Author, Title, subject or date by first logging in to the Members Area of this website.